If you currently owe a debt to a bail bondsman, or considering signing a bail bond agreement on behalf of another, you may be concerned about the possibility of garnished wages. Continue below to learn what you need to know about bail bond contracts and the potential consequences of failing to repay a bail bond debt. To understand your responsibility under a bail bond agreement, it helps to learn how a bail bond company operates. You see, when a person is arrested and detained in county jail, they or someone they know can contact a local bail bond company to acquire a bail bond in order to get a defendant released from custody. But in order for a bail bondsman to get a defendant released, they must sign a contract themselves known as a “surety bond”, which holds them liable for the full bond amount in the case that the defendant fails to appear for court. Since the bail bondsman is liable for the full bond amount set by the judge if the defendant fails to appear (FTA), they too have their own company agreement that holds the cosigner liable for that same amount under the same circumstances. Basically, the purpose of a bail bond agreement is to protect the bail bond company from having to pay back the full bond amount to the jail if a person forfeits their bail. It also plays a role in giving defendants a financial incentive to appear for their court hearings. Once you decide to sign a bail bond contract, whether to get yourself released from jail or someone else, you take on the same liability that the bail bond company took on when they signed the surety bond. In fact, the entire liability is essentially transferred to you. After signing, if you or the person you bailed out of jail fails to appear for court, you will be legally accountable to pay back the entire bond amount. For instance, bail set at $5,000 will cost you between $500 and $750 for a bail bond; money that you do not get back. If you or the person arrested fails to appear for court, you are responsible for paying back the $5,000 in full. If all goes as planned, the bail bond company is relieved of their financial liability, plus receives the non-refundable fee you pay for the bail bond service. You can expect to pay anywhere from 10 to 15% of the total bond amount for an Indiana bail bond. See our blog, “How to Use a Local Bail Bondsman When in Jail” for help on getting a prearranged bail bond for an arrest warrant, or to get a loved one out of jail. 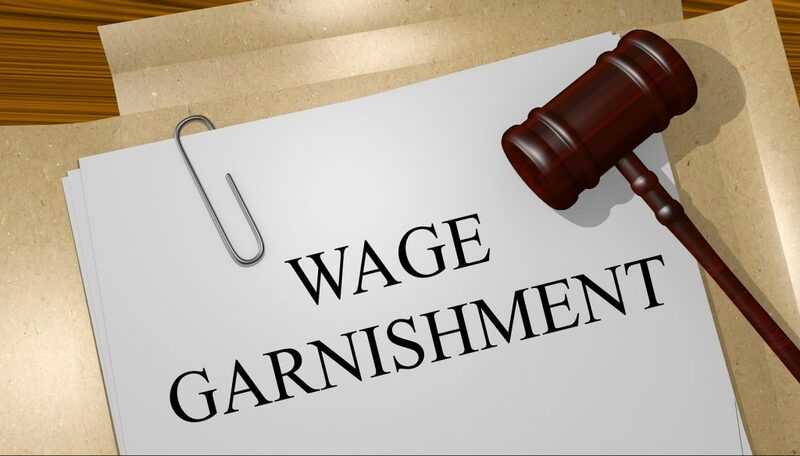 Now that you understand bail bond agreements and liability, you can understand the circumstances of garnished wages. Bail bond companies have the same legal rights as all other creditors, which means they can pursue a lawsuit and have a court order you to pay the debt owed to them. If this happens, and you are unable to pay the outstanding bail bond debt, your wages can be garnished. The bail bond company will apply for a writ of execution, which is served by the sheriff’s office directly to the debtor’s employer. Subsequently, the employer is bound by law to withhold, and then remit, a portion of the debtor’s wages to the bail bond company. See our blog, “Can I Get Financial Assistance for a Bail Bond?” to learn your options for getting help with the cost of bail in Indiana. Right now, Woods Bail Bonds is currently offering 8% bail bonds! This is the lowest rate in years, and only available here! That means you only pay 8% of your total bond amount, rather than the standard 10 to 15% rates required across the state. In order to qualify for this low rate, you must meet certain criteria. Best of all, we serve over 33 Indiana counties with reliable, 24 hour bail bonds, even on National holidays. Call 317-876-9600 to talk to a friendly and knowledgeable Indiana bail bondsman to learn if you can qualify for 8% bail bonds in Indiana! This entry was posted in Bail Bonds and tagged Bail Bond Agreements info, Bail Bond Agreements liability, bail bond company garnish wages, Bail Bond contracts facts, bail bondsman garnish wages, cheap bail bonds Indiana, Indiana bail bonds. Bookmark the permalink.